This locomotive was built by the Heisler Locomotive Works in Erie, Pennsylvania for the Potomac Electric Power Company (Pepco) in 1938. 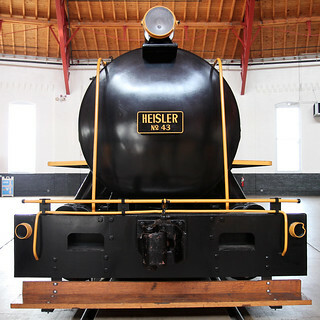 Unlike other steam engines, this unique 35-ton locomotive did not need a fire to produce steam; instead it was filled with steam and superheated water from the power plant’s boilers under high pressure at temperatures around 400 degrees Fahrenheit. The locomotive was capable of operating by itself for approximately five hours on one charge of steam and superheated water. From 1938 until 1974 the Pepco locomotive operated at the Buzzard Point Power Station in Washington, D.C. hauling coal. From 1974 to 1978 it was used at the Potomac River Power Station in Alexandria, Virginia. In 1979 Pepco restored and donated the locomotive to the National Museum of American History’s Work and Industry collection where it has been in storage until being donated to the B&O Railroad Museum in Baltimore, MD.